Afterschool programs are vital to our nation’s children, families, and communities. But the tough funding challenges these programs already faced were exacerbated this year when the Trump administration proposed eliminating federal support for afterschool and summer learning programs. If Congress were to go along with that proposal, students and families in our community would be adversely affected in very significant ways. That’s why I joined hundreds of afterschool advocates from across the country at the annual Afterschool for All Challenge, as we teamed up to educate Congress about the myriad benefits 21st Century Community Learning Center (21st CCLC) afterschool programs provide. Sponsored by the Afterschool Alliance, the Afterschool for All Challenge featured a day-long visit to Capitol Hill by hundreds of afterschool leaders from around the nation. And while we met with U.S. Senators and Representatives, afterschool advocates Maine to California turned up the grassroots volume by using social media to send hundreds of messages about the need to protect afterschool funding. 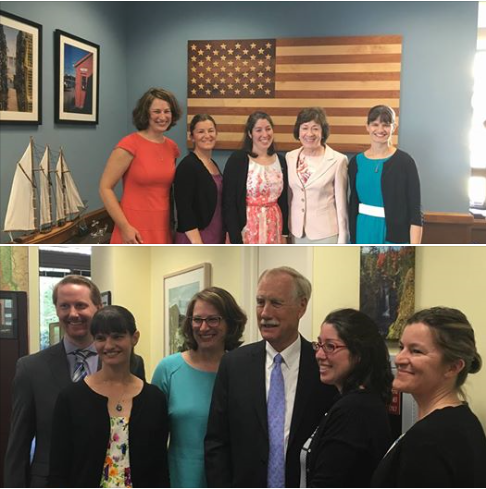 The Maine team (Trina Dorn, LearningWorks and Erin Frati and Kristyn Brownell, Maine Afterschool Network) and I had the opportunity to meet with Senator Susan Collins and Senator Angus King as well as an aide to Representative Chellie Pingree about how important afterschool programs are to our community and all they do for children and working families. We shared specifically how 21st CCLC funding allows LearningWorks Afterschool to serve nearly 1000 elementary-aged students a year at 11 sites in Portland, South Portland, Biddeford, and Waterboro. This valuable resource benefits students right now, through building student academic skills, confidence in learning, and community involvement. It also builds our community for a better future with engaged citizens who aspire to graduate high school, attend college or learn a trade, and be productive members of our cities and state. We told them that afterschool programs keep kids safe, inspire them to learn, and help working families by providing homework help, STEM (science, technology, engineering and math) education, mentoring, sports and physical activities, healthy snacks and meals, robotics, computer programming, college- and job-readiness, opportunities for hands-on learning, and more. We noted that years of research demonstrate that afterschool and summer learning programs work, and support a wide range of positive outcomes for students, families, and communities. We reminded lawmakers that these programs make it possible for many parents to work, as losing their afterschool programs would jeopardize their ability to hold jobs and support their families. We said that federal funds support afterschool programs for 1.6 million students in the United States, including 6,000 in Maine. Ending federal funding for afterschool would result in fewer programs, diminished program offerings, and gutting of the partnerships between afterschool and summer learning programs and museums, businesses, colleges, and others. At a time when 1 in 5 children in the United States is unsupervised after the school day ends, we said we believe that America needs more quality afterschool programs – and we hoped lawmakers, businesses, and foundations will come together to invest in afterschool. We went to Washington because we believe that by educating lawmakers about afterschool programs benefits our community. That was a message we were proud to deliver! Let’s hope they heard us! Amy Pichette is the Director of LearningWorks Afterschool, an Afterschool Ambassador with the Afterschool Alliance, and a member of the Starting Strong Summer Literacy and Leadership Committees.